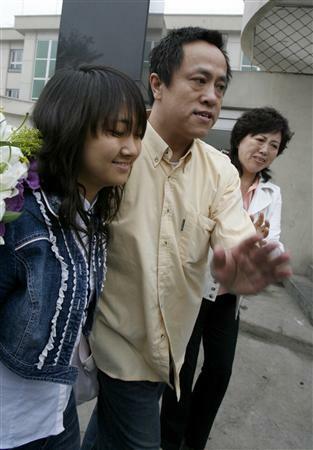 According to a Reuter's report, at 17:21 EST, Zhao Yan was free. Just a few hours ago, the New York Times announced that one of its Chinese research assistants with the initials ZY, who was imprisoned by the Chinese Government on less than significant evidence for leaking state secrets when the Times ran an early story announcing a change in the top tier of the Chinese government, will be released by this Saturday morning. Tomorrow morning Beijing Time would be later this evening, EST. ZY is the laureate of the 2005 Reporters Without Borders (RSF) press freedom prize. I have been following this story since its inception in 2004 and I pass this along a with no small measure of elation and relief. I will not mention his name until he is safely released, out of concern that what the Chinese government might consider infelicitious coverage might somehow hamper his release. Let me just say that I'm glad this ignominious incident will be over. His job at the NY Times, as far as they are concerned, is still his. The solidarity demonstrated by RSF, the blogosphere, and the NY Times has been duly vigilant and heartening. [A] Chinese research assistant for The New York Times... is expected to be freed Saturday morning after serving three years in prison on a fraud conviction that sparked international outrage and brought criticism on China’s legal system. [He], 45, completed his full sentence. His case was marked by legal irregularities and at one point a Beijing court even withdrew all charges against him. ZY is the laureate of the 2005 Reporters Without Borders press freedom prize. But [He] was never released, and the charges were reinstated without explanation. President Bush and Secretary of State Condoleezza Rice lobbied on his behalf with President Hu Jintao of China. Human rights groups and journalism advocacy organizations criticized his arrest as politically motivated and without merit. [He] was working as a researcher in the Beijing bureau of The Times when State Security agents detained him in September 2004. He would eventually be charged with disclosing state secrets to The Times, an accusation linked to an exclusive Times article about the inner workings of China’s top leaders.